Mild temperatures, sunny skies, and soft breezes marked the first day. Southerly busters were the hallmark of the next. So really, the only thing left on offer on Geelong’s Corio Bay for the final day’s racing in the 2019 Victorian State Championships for Etchells, 49ers and 29ers, would be a smorgasbord of everything. This was duly served. A whiteout, caused by the almost opaque drizzle, greeted the sailors this morning. The Race Committees were more inspired, however, and got the fleets out on the water pretty much as prescribed for racing at 1000hrs. Only a short stay under the Answering Pennant was required before the two courses commenced their racing. The 9ers began at 1020hrs, and the Etchells from 1100. 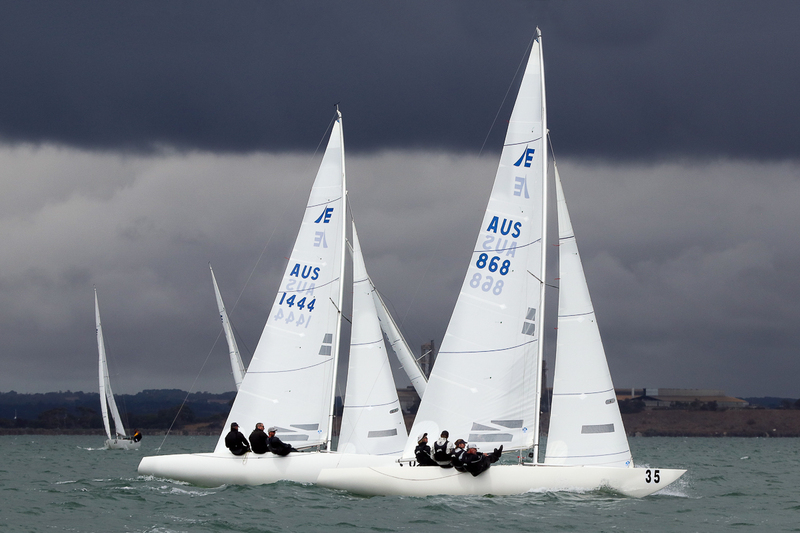 There would be three races for the Etchells and four for the 9ers - full day’s compliment. The wind ranged around from 200 to 280 degrees, and was anything under five knots as it oscillated. Once it settled on the 250 degrees type area, all it did all day was go from 6 to 15 knots, as swiftly and as frequently as it so chose. An eyes out of the boat kind of day, for sure! Now in amongst all of that diversity, no matter whether you were sailing an Etchells or skiff, and irrespective of your experience in the America’s Cup, Volvo Ocean Races, Olympic Classes, or any other form of sailing, there were two definitive and common elements. The sailors all commented on how tired they might be, but more importantly, just how much fun they had enjoyed on the relatively flat track just in front of the Royal Geelong Yacht Club. Indeed, by the time everyone was back ashore a de-rigging, it was shorts, sunscreen, hats and sunnies, and the temperature shot back up into the mid-20s This was most welcome, for some of the rain squalls that rolled in from behind Geelong were as icy as they were shifty, with 30 degree flicks more than common. All I can say is a big thank you Glenn Norton for loaning some of your gear to me, which was a saviour, for like many, I had believed the earlier weather forecasts! We were standing quayside in shorts, but earlier on out on the water I was sure my hands were about to fall off they were that cold. “It has been a bit up and down the last couple of days. Yesterday we had a blowout, the day before was all sunshine, and then this morning there was a persistent mist around. If you fronted up today and looked at what we have right now, you would think how beautiful it is.” Certainly it was a flat track with a steady and consistent 10 knots from the West, and a totally blue sky. The brothers are just so conversant with the class, that they can get a 65-minute race in, as long as there is a consistent 5 knots or more blowing. Combine that with a true appreciation of the conditions, and more often than not they get a full compliment of races in for the series. Kevin said, “Knowing the speed of the boats, and how they travel through the water, and whether they want a 60, 70 or 80 minute race, we can set up a track accordingly. Equally, if it is going awry, we can change it around smartly.” Indeed this is why the Etchells had two races finishing downhill, and then complete the third with a work back to windward, as this was closer to the club to get them all home, and ready to place the boats back on their trailers. The crew aboard Magpie have been tremendous performers for some time now, but in some of the recent events, the scoreboard did not carry that name as much as it had previously. Today, that changed, when once again they were on top. Amongst the many accolades the crew holds are Line Honours and race record holders in the Hobart, and former World Champions. The particular line up being utilised at Geelong, Graeme Taylor, James Mayo and Richie Allanson are former Australian Champions, with Richie as part of the reigning Australian Championship crew that comprised Iain Murray and Colin Beashel, as well. They are all very close friends, and some of the magic began to reappear at Gosford recently during the NSW title. “The next thing for us is Mooloolaba, then off to the Worlds in Texas.” The 2020 Australian Championship is at Brighton, and you get the feeling they may just like to claim that particular title back, but for now, the crew of Magpie were very happy to be the Victorian Champions once more. Kirwan Robb and his crew on board, Triad, won the Corinthian trophy with an incredibly consistent effort, always finishing between fourth and eighth place. They ended up fourth overall. Jill Connell’s Odyssey with Gordon Maguire and Wade Morgan were the Grand Masters. 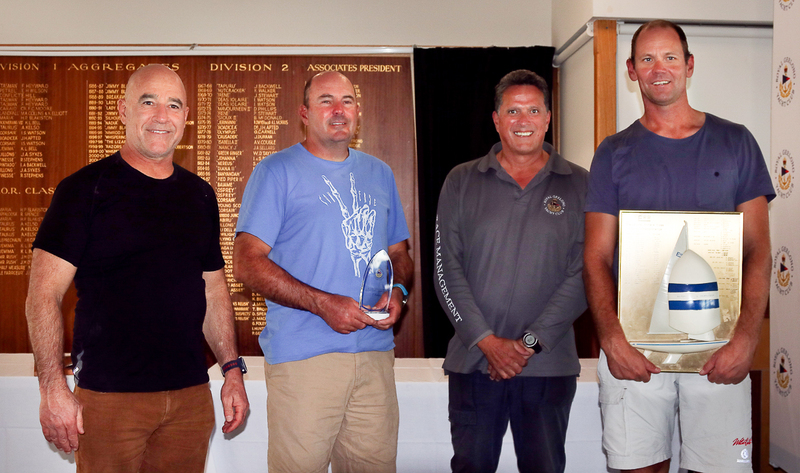 Chris Hampton’s, Tango, with Sam Haines and Charlie Cumbley were the winners of the Masters division, and Jeanne-Claude Strong won first female helm on her boat, 1435, with Tom Slingsby, Marcus Burke and Kate Devereux as crew.